Biography of Luang Por Lum Siri Tammo (Pra Kroo Siri Tammarat) – Wat Samakee Tam. Nong Hlang, Bangkok. Luang Por Lum Siritammo was born with the name Lum Sae Jeng, and was born on the 13th of August 2472 BE on a Saturday of the 11th Lunar Day, in the Year of the Snake. He was born at 14:44 PM in the afternoon, at home in Ya Praek district of Pra Pradaeng Municipality, Samut Prakarn Province. His Father was called Jui Tiang Sae Jeng, and his mother was Mrs. Pin Sae Sim. In 2479 BE, his Father passed away when Luang Por Lum was still a young boy of 7 years old, and he had to go stay with his Grand Parents nearby. As he reached the age of Colege, he attended the school at Wat Laem temple, until he finished fourth grade. After this he left school and worked as a Gardener. Then his Grandfather passed away, and the young Lum finally had to go it alone. He went to Pra Ajarn Chadtr (Luang Por Chadtr) and asked to learn to write in ancient Khom Magical Scriptures, and learned with him until he became fluent in reading and writing Khom. Once he reached the age to be able to ordain as a fully fledged Bhikkhu, he Ordained into the Sangha at Wat Ban Ya Praek, on the 25 April 2492 BE. 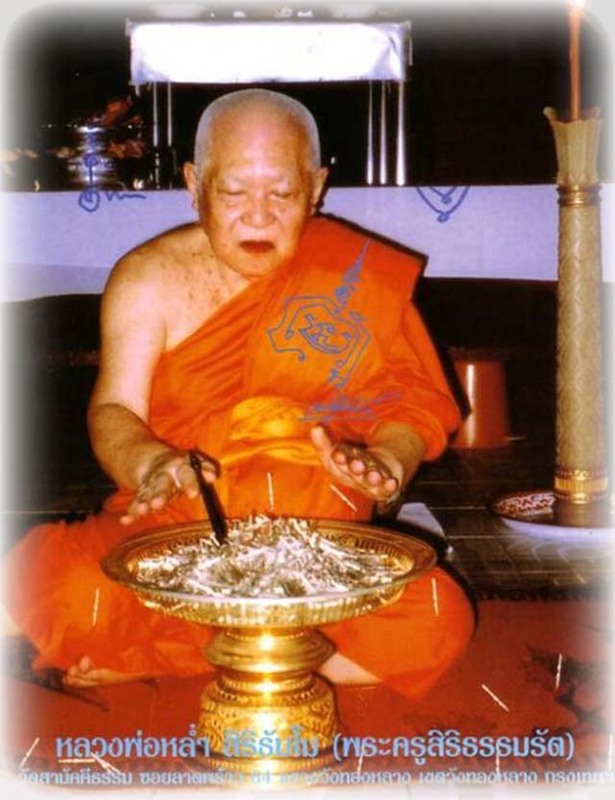 His Upachaya (ordaining officer) was Pra Kroo Sirisilakun – the ‘Jao Kana Jangwat Samut Prakarn’ (highest monk of the Samut Prakarn Province). His assisting officer in Chanting (Pra Gammawajajarn), was Pra Kroo Pheuy (Pra Kroo Sathidt Tammakun), who was the Abbot of Wat Ban Ya Praek. His Anusawriyajarn was Pra Samu Pong (Pra Kroo Boroma Saturagij), who was Abbot of Wat Bun Wangsanawas. 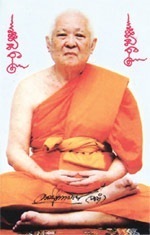 He was given the Dhamma name of Siritammo (Siri Dhammo). After his Ordination, he took residence at Wat Ban Ya Praek, learning Theoretical Dhamma and also practicing Vipassana Kammathana Mindfulness Meditation. 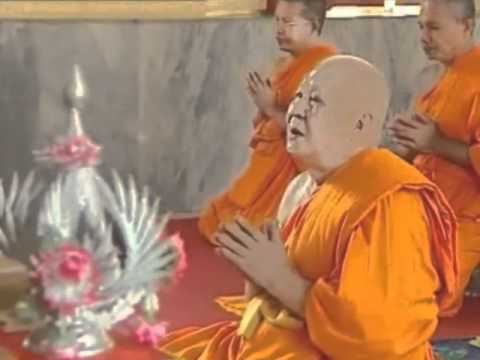 He studued under the Laymaster Ajarn Arp Som Sanit, until he finished his studies and took is Examinations at Sanam Luang (Royal Fields in front of the Royal Palace), and attained the qualification of ‘Nak Tamma Dtri’ (Batchelor of Arts in Dhamma) in the same Year of 2492 BE. In the Year 2493 BE, after the Rainy Season Retreat was over, Luang Por Lum ventured out on udong (Forest Wandering), and practiced Kammathana Vipassana, wandering through the provinces, and was the leader of the rest of the group of both older and younger Monks. After 3 Months Wandering, he returned to Wat Ban Ya Praek. It was back here that he began to search out various formulas for curing illnesses and healing according to Traditional Methods. He also continued his practice of Khom Agkhara Magical scriptures, and how to compose and design the Sacred Yantra which the Kroo Ba Ajarn of previous Generations had left for their followers. Each Year, as Luang Por Lum travelled on Tudong, he found chances to meet and learn Magical Wicha from different Lay masters and Bhikkhus. He learned how to Chant Kata and cast spells with Pra Ajarn Gliang (Pra Kroo Sopanawisut) the Abbot of Wat Suttisope (Sri Saket). His Wicha of writing Khom Spells and Sacred Geometry of Yantra came from Ajarn Pan Nonta, the Ex-Sherrif of Tung Sa Ard (Surin), who was a direct apprentice in Magic to the great Luang Phu Sukh of Wat Pak Klong Makam Tao as Ajarn Pan was still a member of the Sangha. Apart from this, Luang Por Lum was able to become the apprentice of the Great Luang Por Kreun (Pra Kroo Kosita Tammasarn), of Wat Sangkositaram (Supannburi). He would travel back and forth to learn more and more from him. 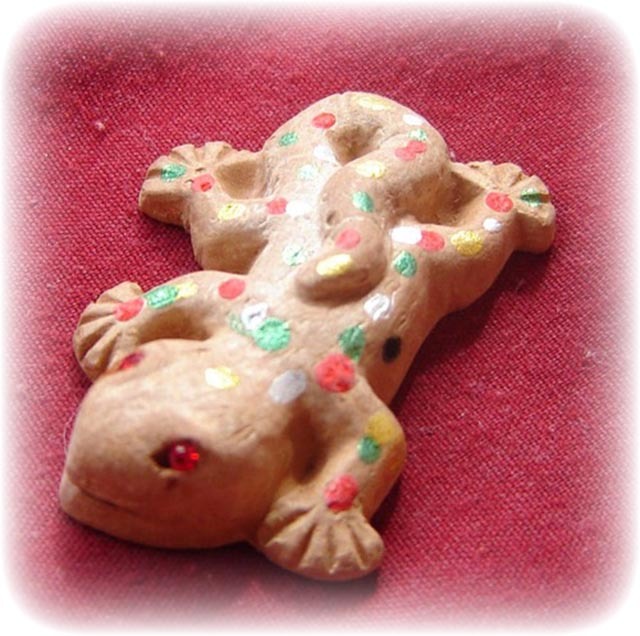 Luang Por Lum was lucky to get this chance to learn Magical Wicha with Luang Por Kreun, whose Jing Jok and Tugkhae lizard charms are the most powerful of all Thai Gecko amulets. He got the chance as LP Kreun came to Wat Ban Ya Praek to assist in an Ordination ceremony. LP Lum was the one appointed to prepare LP Kreuns quarters, so he was able to prostrate to him and ask to be accepted as an apprentice. At first, LP Kreun did not answer and just continued to talk general conversation, but LP Lum knew that in fact, the Master was testing and checking his mental ability behind the scenes. After testing him a while and also checking his ability to read and write Khom, LP Kreun commented that it was important to read fluently and be able to read between the lines to interpret the meaning. He said most old Kampir (Grimoires) of Magic were all in Khom scripture, so this was an essential part of the Magicians armory. One day, a monk came to the temple and said that Luang Por Kreun was calling for him, and he must rush to see him. When Luang Por Lum arrived and entered the Hut of Luang Por Kreun, he saw that the monk was not going to live much longer. LP Kreun sad that he had been thinking of Luang Por Lum and his great ability in meditation and Wicha Khom, and that although he wasnt attached and worried about magic, he did worry that the Wicha of the Tugkhae lizard was a Wicha that still had no Heir to cvontinue its existence in the world. He then began to teach Luang Por Lum the Wicha Tugkhae, and taught him to Chant and focus on the Kata Tugkhae all night until he became fluent and comfortable and in absorption with it. He must perform the chanting and make as many Tugkhae lizards approach the hut as possible, if he was able to do this then he had begun to master the Wicha. When he would make an image of the Tugkhae in any shape or form, he should use the Novahorakun Kata to inscribe on the Tugkhae, and the Kata Twaadt Himapant, starting from the head moving towards the tail. If the Tugkhae amulet were to be made from sacred powders, then the powders must be made with powdered ‘Pong Lop’ (residue chalk from inscription of Kata and Yant on a blackboard, which are then mixed in to make amulets). The amulets must be chanted into with invocations until they can wiggle around as if living. If small miniature amulets, they can be blessed all together in one go using the aforementioned Kata 108 times. If large ones, they must be empowered individually.